Apparently, Australians have a thing for writing about people with autism. I'm okay with this. From all those perspectives swimming around, you might think that this book was incredibly complex and sophisticated. It actually didn't come across that way to me. I feel like it ended abruptly without developing a lot of themes it started with, and without satisfactorily having Candice save the world, as she had set out to do. 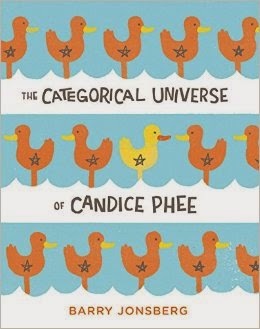 I enjoyed the book, but I was surprised that I didn't enjoy it more, what with the themes of multiple universes and friends who are oddballs, which tend to be favorites of mine. That is why I only gave it three stars. It's a fun read, just not amazing. This book was originally published under the title, My Life as an Alphabet because the chapters were organized thematically in alphabetical order. When I first picked up this book, this format almost prevented me from buying it because it seemed so gimmicky. But the author uses the format smoothly enough, that after awhile, I pretty much forgot about it. When reading this book, pair it with a pumpkin shake. Candice's mum has a tendency to call her, "Pumpkin." She does not understand why calling someone a gourd is a term of affection, but she puts up with it, for her mum's sake.